Antigypsyist hatred is part of everyday life in almost all online formats and on many websites. Counter-speech, however, takes place only rarely. 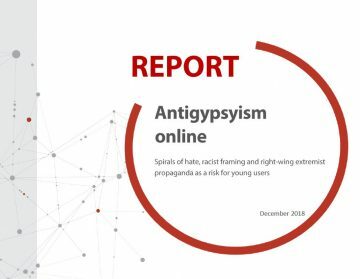 Right-wing extremist groups and activists in particular are successful in spreading antigypsyism on the Net, inciting hatred and defaming members of the minority group of Sinti and Roma. This is shown in a recent research report by jugendschutz.net, the Central Council of German Sinti and Roma and the Documentation and Cultural Center of German Sinti and Roma. As part of a pilot project, several thousand documented pieces of content on the Internet were investigated, and a variety of discriminatory stereotypes were identified. More than 400 violations of youth protection law and often criminal law were documented. In addition, the dynamics increase in commentary sections was striking: Antigypsyist statements reinforce each other mutually up to inhuman representations and specific calls for violence. The German Ministry of Family Affairs supports projects that provide educational and advisory work, raise awareness of mechanisms of exclusion and protect people affected by antigypsyism. Federal Minister of Family Affairs Dr. Franziska Giffey emphasizes: “Prejudices against Sinti and Roma, which are spread through social media, should not be accepted. This fuels hatred and leads to discrimination and exclusion. The results of the pilot project of jugendschutz.net and the Central Council of German Sinti and Roma show how old stereotypes of right-wing extremists are being reinforced and gain new momentum in new media. We want to promote those who take concrete action against that.” Minister Giffey thanks all those who stand up against hate, for democracy and for an unprejudiced living together. The Central Council considers this a task of the Independent Expert Commission on Antigypsyism, was appointed by the Federal Government and in the beginning of 2019, to analyse antigypsyism online more in detail, and to develop recommendations for action on policy level, as well as in society. jugendschutz.net is the joint competence centre of the federal and state governments for the protection of children and adolescents on the Internet. The centre researches the dangers and risks of youth services and urges providers and operators to design their services so that children and adolescents can use them carefree. Jugenschutz.net receives information about violations of the protection of minors on its hotline and ensures that these are quickly eliminated. The work focuses on risky contacts, self-harm, political extremism and sexual exploitation of children. The work on political extremism is funded by the Federal Ministry for Family Affairs, Senior Citizens, Women and Youth within the framework of the federal program “Demokarie Leben!”. Problematic content in the network can be reported at https://www.hass-im-netz.info/hass-im-netz-melden. The Central Council of German Sinti and Roma is the political representation of German Sinti and Roma based in Heidelberg. As an umbrella organization, the Central Council is committed to promote the equal participation of Sinti and Roma in politics and society as well as to combat antigypsyism on national and international level. The Documentation and Cultural Centre of German Sinti and Roma is a minority institution that has been fighting against antigypsyism for over 30 years. Due to the continuous work and the content-related competence, the centre gained great recognition as a specialist institution in Germany and abroad. In addition to cultural policy work, the focus is on human rights education, anti-racism work and historical education on the history of the minority. With the Berlin project office, the Heidelberg based Documentation and Cultural Centre is present in the capital since 2015.The work of the Berlin project office is part of the federal program “Demokratie Leben!” funded by the Federal Ministry for Family Affairs, Senior Citizens, Women and Youth.